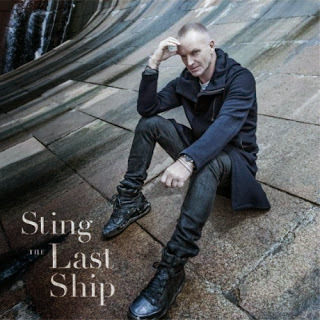 Those who have the ability to forget that Sting was once a dynamic vocalist who wrote some ferociously good pop songs may enjoy his latest album, The Last Ship (Cherrytree/Interscope). For everyone else, this effort, his first after a decade-long sabbatical in the classical ranks, should find it among the British legend’s most tiring and tedious. Ostensibly dealing with the decline of the shipbuilding trade during the 1980s’ in the city of Sting’s birth, Newcastle, England, The Last Ship finds Sting serving in the role of a minstrel. And in that capacity alone he does quite an admirable job, too, as he capably conjures moments of dramatic, eloquent storytelling, often enough in spoken-word passages. Besides, the problem with the album isn’t its script, so to speak, but rather its soundtrack. For the most part, Sting sings/speaks over some indiscriminate strumming—some brief orchestral flourishes also surface from time to time—the words coming across as far more considered than whatever sense of a tune carries them. Pop music (if that’s what you want to call this) may not be the right medium for telling these sorts of tales or, more to the point, Sting doesn't pull it off as he should. As demonstrated by even the most literate-intensive singer/songwriters, from Leonard Cohen to Joni Mitchell to Bob Dylan, the music must possess some engaging quality in and of itself, whether it’s a chord structure or a chorus or even just a hook. Otherwise, it’s just prose with some ambience. The album’s not a lost cause completely, as solipsistic love songs “The Night The Pugilist Learned How To Dance” and “I Love Her But She Loves Someone Else” evoke the sort of romantic longing that would’ve complemented The Soul Cages or Ten Summoner’s Tales. Overall, though, The Last Ship lacks the musical intrigue that could’ve made what may very well be an evocative tale into an album worth listening to.